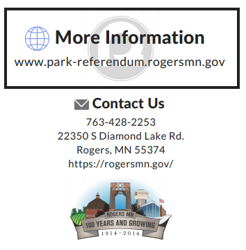 By a very close margin, the resident's of Rogers voted YES to the City of Rogers Parks and Rec Sales Tax Referendum. It now goes to the MN Legislature to be voted on along with other cities that passed similar sales tax referendums (i.e. Elk River). As noted in previous ROYBA communications, the $16MM+ funding package included several projects that will have a direct impact to ROYBA players (ex. South Community Park & Indoor Turf Facility) but there are a myriad of other projects benefiting almost every family in the area. Once passed in the MN Legislature, the list of projects will be prioritized, plans finalized and construction to begin once the thaw occurs in 2020. We will keep you posted on how you may be able to influence the steps along the way, including ensuring South Community Park is high enough on the list to begin in early 2020.